Do you see my photo of the Focaccia with Grape Tomatoes? Yes? After I took the last shot and gave the all clear to my family, the focaccia lasted maybe 10 minutes. They went crazy! 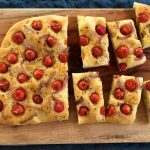 This focaccia bread is absolutely delicious and has so much flavor. Sweet tomatoes, sauteed onions and the fruity olive oil offer a wonderful contrast to the fresh rosemary and sea salt sprinkled on top. The focaccia bread itself is soft and airy but still has a satisfying chew to it. As I write this, I’m thinking I’m going to have to make it again tonight. This may be my new favorite focaccia recipe. I have been baking my way through Paul Hollywood’s “How to Bake” cookbook when I ran across it. I gave his recipe a go, adding my own toppings of tomatoes and onions and I have to say it is spectacular! It reminds me of the focaccia offered at a nearby Italian market, that is absolute heaven to eat. I’ve been wanting to ask them for the recipe but never worked up the nerve. It probably wouldn’t do me any good anyway, as the recipe I’m sure makes enough focaccia bread to feed a small village. Well not to worry, this recipe is just as good. Focaccia does use a yeast dough with a first and second rise. Really easy but as with all yeast doughs, you have to plan ahead a bit. If you want it for dinner, I would start in the early afternoon. I knead this dough by hand because I enjoy kneading bread dough but you can go ahead and use a stand mixer if you prefer. As with any focaccia, you can change out the toppings depending on your tastes and what you have on hand. Heck, this would still be great with just the olive oil and salt. 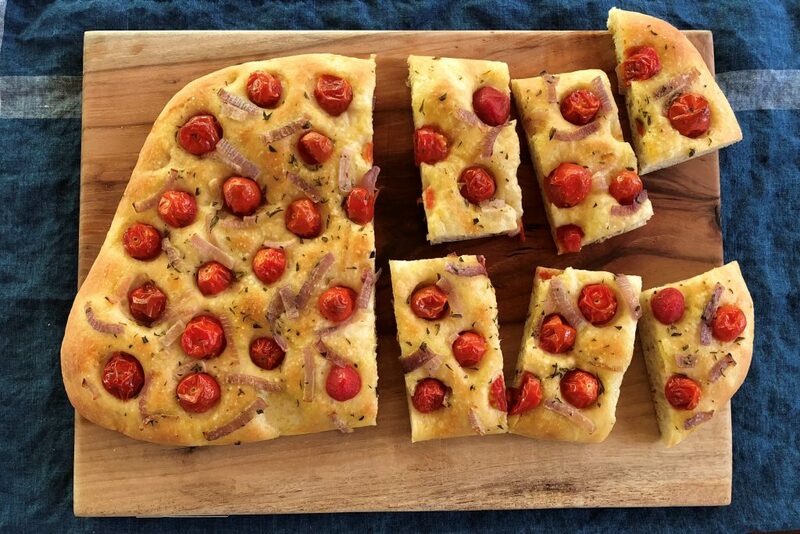 If you have any left over (you probably won’t) just wrap it up and store the focaccia at room temperature for a day or two. I have been known to throw a few slices on a pizza stone to heat for about 5 minutes for a quick lunch. It gets nice and warm with a slightly crunchy bottom. Soooo good! Adaption of Paul Hollywood’s Focaccia recipe in “How to Bake”. The dough makes enough for 2 focaccia breads. You can freeze half of the dough for another date. 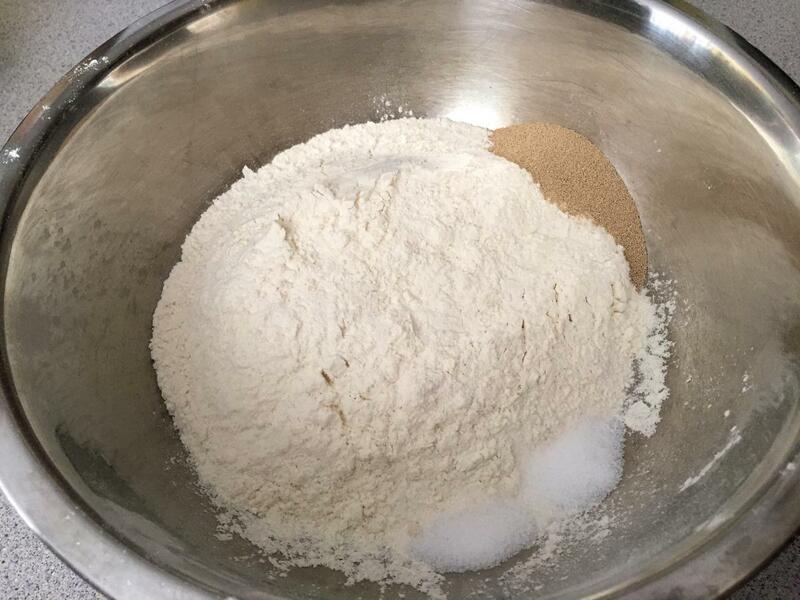 Weigh or measure out the flour into a large mixing bowl. On one side of the bowl add the salt and on the other side of the bowl add the yeast. Add the olive oil and about 2/3 to 3/4 of the water. Mix ingredients together with your hands. Add more water about a tablespoon at a time, if the dough is too dry. You are looking for a wet sticky dough that sticks to your fingers but not "mushy wet" like a batter. You may not end up using all of the water. This dough starts out wetter than a standard bread dough. Lightly dust your counter top with flour. * Knead the dough for 5 to 10 minutes until you have a soft but smooth elastic dough with only a slight stickiness to it. It starts out really sticky and will stick to your work surface, but after about 3 minutes of kneading you will see it become smoother and less sticky. Try not to add more flour, just keep at it! Video - How to knead bread dough. Shape the dough into a nice ball and put it into a large oiled bowl or an oiled plastic container. Cover with a tea towel and let it rise until doubled in bulk. Approximately 1 to 2 hours. It all depends on the temperature of your home and unexplained forces of nature. Prepare your pan - liberally oil 2 baking sheet pans with olive oil. Place the risen dough on to a lightly floured counter top. Gently shape into a thick rectangle and then cut the dough in half. Do not knock the dough down as you are trying to keep as much air as possible in the dough. Take one of the dough pieces and with your hands, press and stretch the dough out in a even layer, into the desired shape of the focaccia. The shape can be irregular, which is fine because now it looks rustic. 🙂 Place the dough on to the prepared sheet pan. Shape it a little more if you want. Do not stretch it to the edges of the pan. You want a thick dough. Mine was around 13" x 10". Cover with plastic wrap or a large tea towel. Repeat with second half of dough *See notes if you want to freeze second piece of the dough for a later date. Let the dough proof until it is doubled in size for about an hour. It's a little hard to tell when it has doubled, but it will definitely look "puffier". While the dough proofs, preheat your oven to 400°F. Slice or chop the onion and saute it in a little olive oil until soft. Do not let the onion brown. Set aside. When the dough has proofed, make your first focaccia. Generously drizzle 1 to 2 tablespoons of olive oil over the top and gently rub the oil to spread it out evenly. Take half of the grape tomatoes and place them around the dough's surface. Press them firmly into the dough so they stay in place. Sprinkle half of the sauteed onion around and then half of the chopped rosemary. Finally sprinkle a couple of pinches of course kosher salt over the dough. Repeat with second dough if making. Bake for 15 to 20 minutes or until the foccacia is a light golden brown. The bottom of the bread should sound hollow if you tap it. Drizzle some more olive oil over the top and then it let cool on a wire rack. Cut into desired size pieces to serve. I highly recommend weighing out the ingredients, especially the flour. It's really easy if you have a digital scale and your measurements will be more accurate. You can use an all-purpose flour for this recipe, as long as it is a "strong" flour such as King Arthur Flour. Paul Hollywood likes to knead the dough on an oiled surface. He coats his work surface with a little olive oil and then starts kneading the dough. The advantage is that you do not end up adding more flour to the dough as you might with dusting the surface with flour. Makes perfect sense but I still prefer using a little flour. The choice is yours to make. The dough recipe makes enough for 2 foccacia breads. 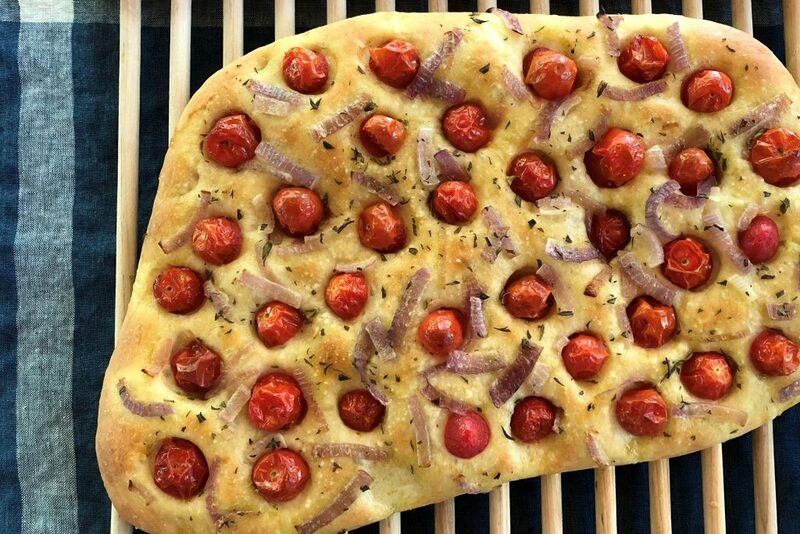 You could freeze half of the dough to make focaccia another day. If you want to freeze the second piece of foccacia dough for a later date, shape it into a smooth ball after the first rising, wrap loosely in plastic wrap and then freeze it in a plastic freezer bag. Make sure you label and date the bag. When ready to use, thaw in the refrigerator overnight or start in the early morning. Once it is soft and pliable, continue on with the recipe for focaccia.